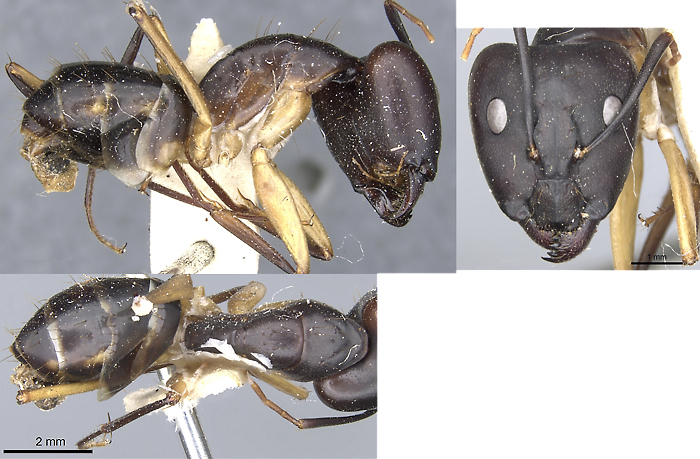 Type form group with pale blotches on dark gaster . 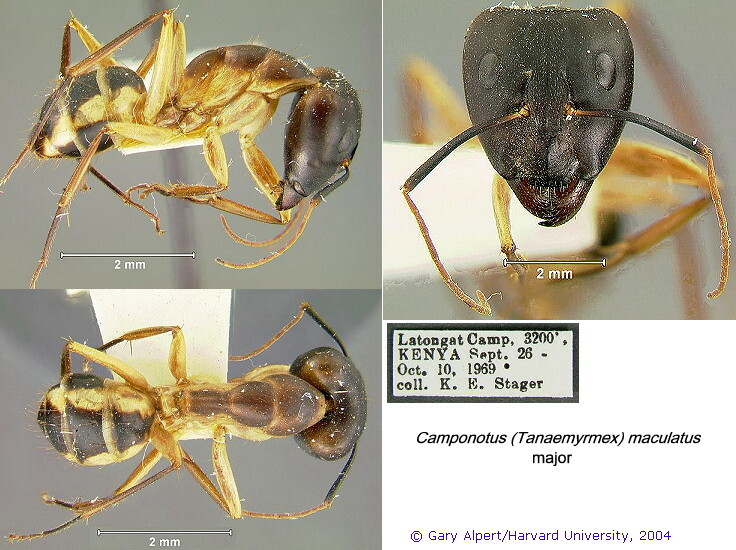 Photomontage derived from images at www.discoverlife.org - originals by Gary Alpert, Harvard University; Kenya specimens. These specimens are noticeably smaller than the type and are more contrasting black and yellow in the major, with a pallid minor (the scales on the Alpert major seem erroneous). 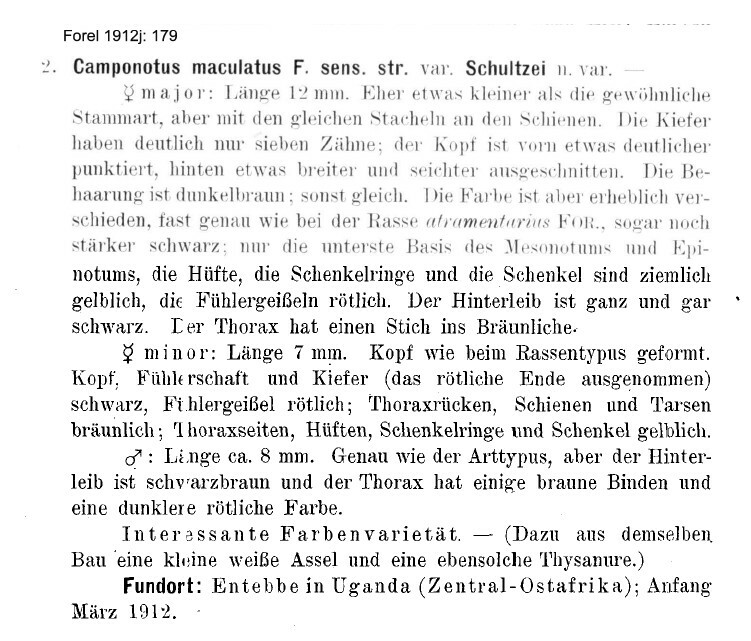 hieroglyphicus (Camponotus (Myrmoturba) maculatus F. st. hieroglyphicus n. st., Santschi, 1917b: 290, Major, Minor & queen) Santschi's (1917b) description is at . Major TL 11.5 mm, HL (with mandibles) 3.5 HW HW 2.5; base colour black but some dark areas, including the mandibles dark brown red; funiculus and part of tibiae reddish, other light areas yellowish; light patches on gaster sharply defined occupying about the borders of the first three segments; gaster shiny, rest of head and body matt, densely reticulo-punctate. Benguela, collector J Cruchet. 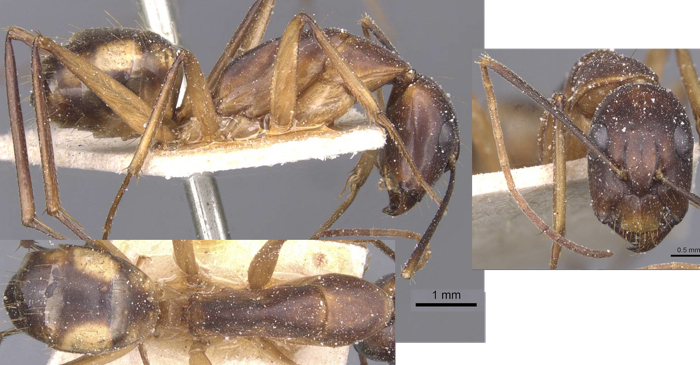 conakryensis (Camponotus (Myrmoturba) maculatus F. var. 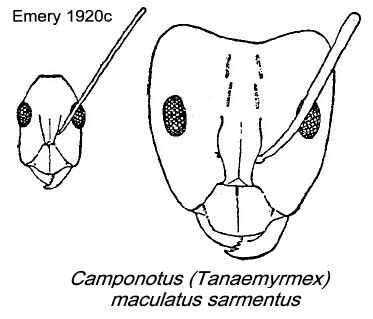 conakryensis n., Emery, 1920c: 13, Major & Minor) Emery's (1920c) description is at . Major TL 14 mm, head 4 X 3.8 SL 3.4; body black, a little less opaque than var. lohieri; first segment of gaster totally yellow below, above with an irregularly triangular black area; pronotum and mesonotum brown; tibia brown. 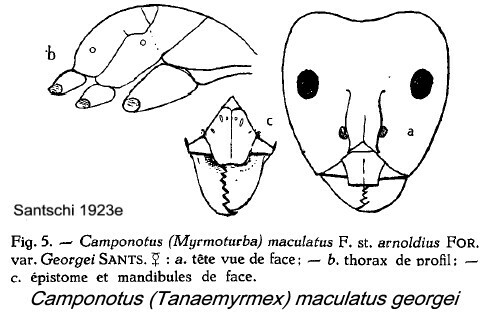 Emery considered the type maculatus was intermediate between lohieri and conakryensis. 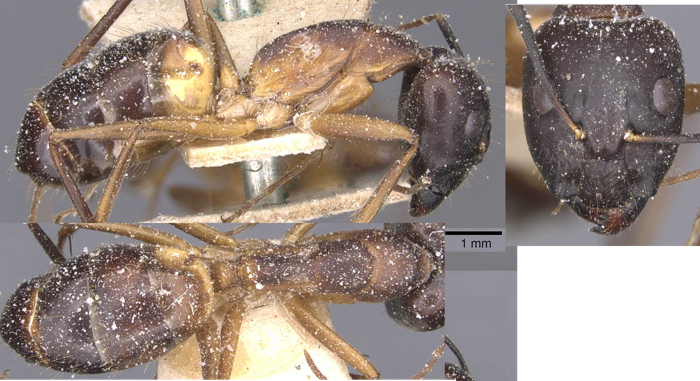 erythraea (Camponotus (Myrmoturba) maculatus F. var. 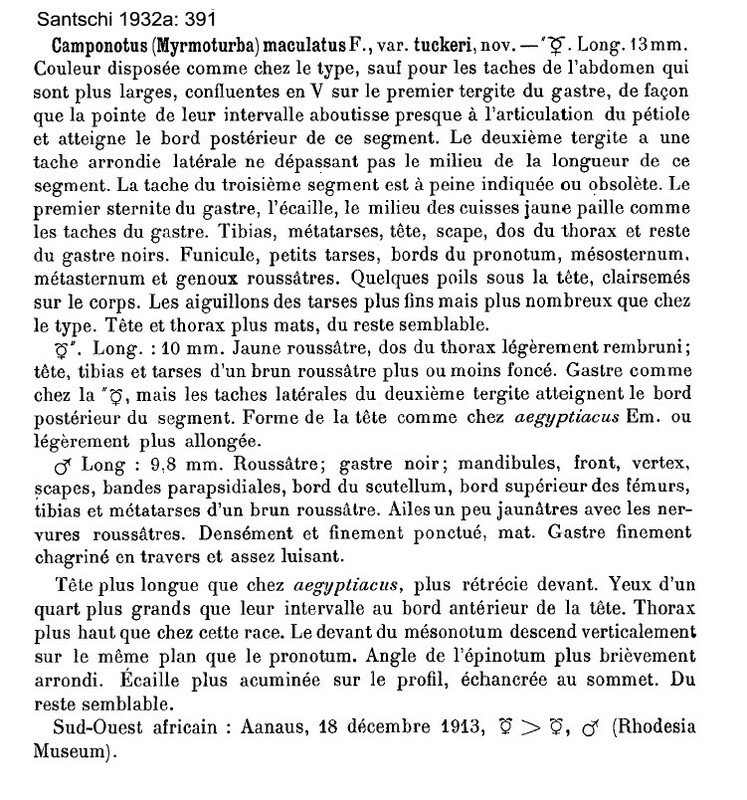 erythraea n., Emery, 1920c: 14, Major) Emery's (1920c) description is at . Santschi (1935b) had from Kenya. 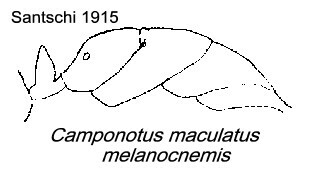 TL 15 mm; colouration as conakryensis but with almost whole of alitrunk dorsum black; head wholly opaque with positions of ocelli distinct. 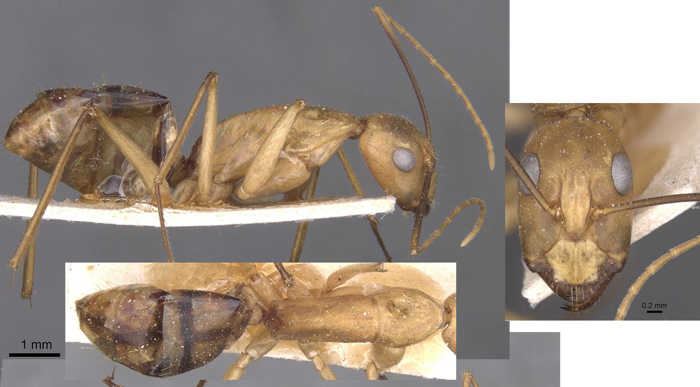 Minor with much narrower head than type maculatus; colouration as in C. aegyptiacus. Asmara, collector Silvestri. 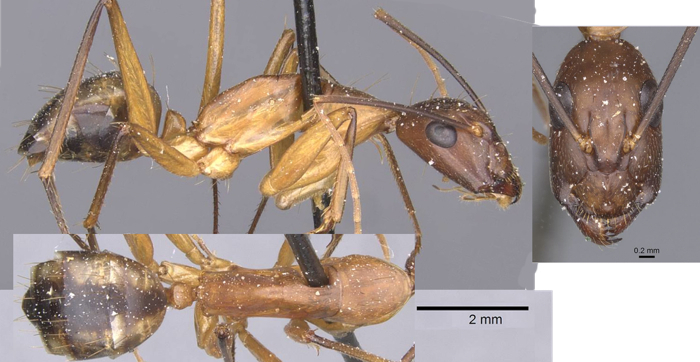 lividior (Camponotus maculatus v. lividior n. var., Santschi, 1911e; 128, all forms) Santschi's (1911e) description is at . Similar to the type form but minors with the base colour dull greyish yellow. 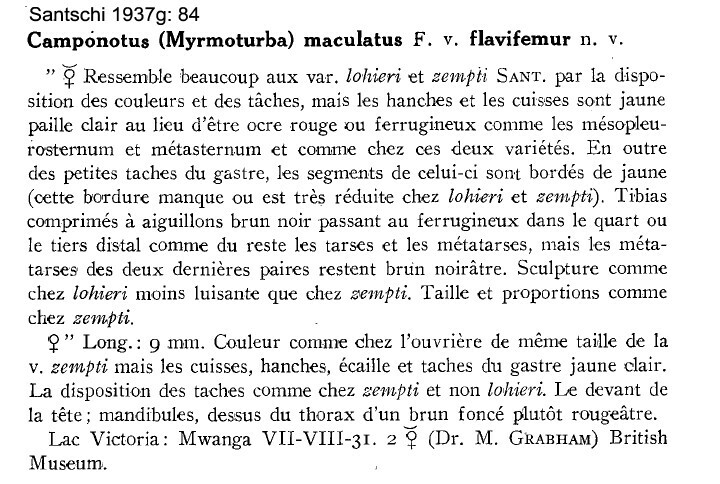 Collector Pobequin, 1899.
tuckeri (Camponotus (Myrmoturba) maculatus F. var. 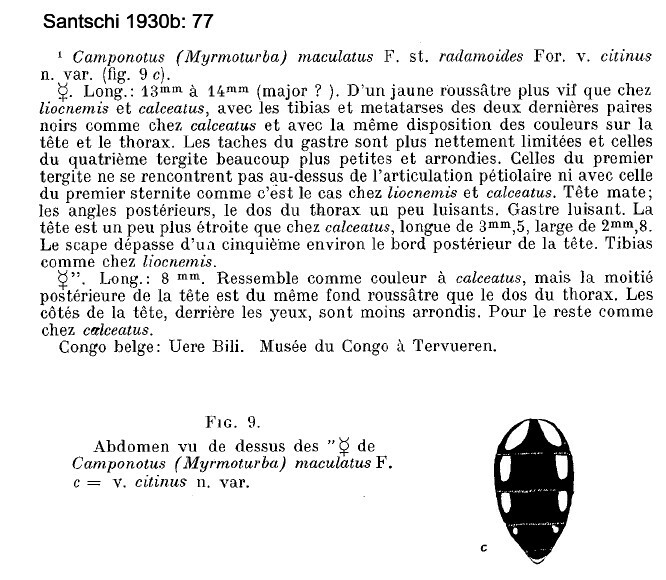 tuckeri nov., Santschi, 1932a: 391, major, minor & male) Santschi's (1932a) description is at . 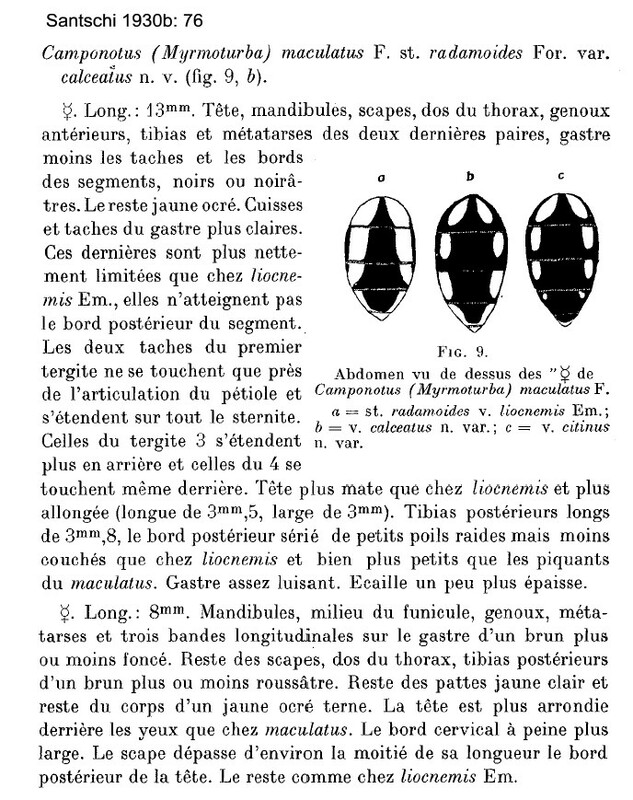 Major TL 13 mm; colour as in the type but with larger patches on the gaster, confluent as a V on the first tergite; base colour black, except funiculi, small tarsi, edges of pronotum, mesosternum, metasternum and genae rust. Underside of head with a few hairs. 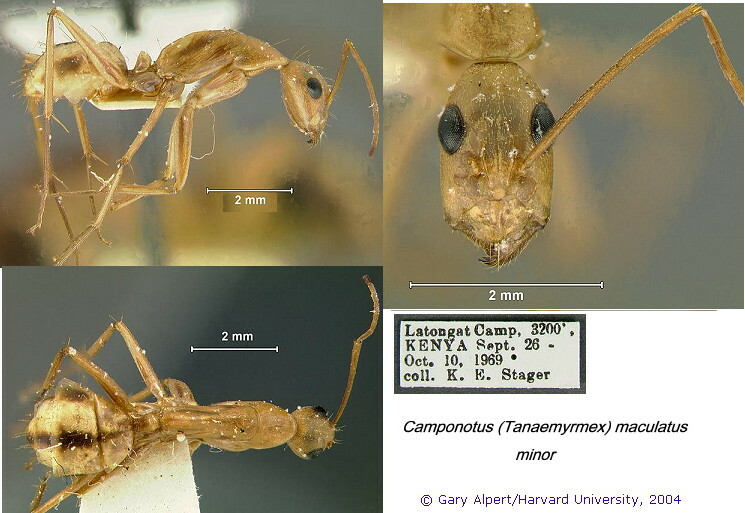 Head longer as with Camponotus aegyptiacus but narrower anteriorly. calceatus (Camponotus (Myrmoturba) maculatus F. st. radamoides For. var. calceatus n.v., Santschi, 1930b: 76, major & minor) Santschi's (1930b) description is at Major TL 13 mm, almost entirely black or blackish with some yellow-ochre areas; minor TL 8 mm, mostly reddish-brown or darker. Santschi's placement is strange as radamoides has a totally dark gaster. 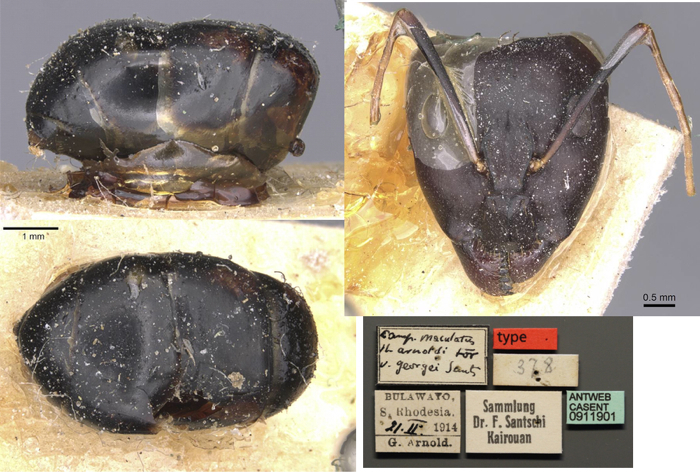 Majors TL 11-12 mm, head black, dorsum of alitrunk and base colour of gaster brownish-black; minors 9 mm, entirely reddish, except for dull patches on the gaster. Victoria Falls, G Arnold. contaminatus (Camponotus (Myrmoturba) maculatus F. st. manzer For. var. contaminatus n.var., Santschi, 1917b: 291, major & minor) Santschi's (1917b) description is at Size range TL 8-15 mm; major head black with posterior angles reddish, almost all the rest brownish black or darker; gaster black with a yellow apical band and lateral yellow areas on the first two segments; minor yellow, gaster with three longitudinal brownish black bands (intermediate between liengmei and melanocnemis). Matopo Hill, G Arnold. diffusus (Camponotus (Myrmoturba) maculatus F. st.. radamoides For. var. 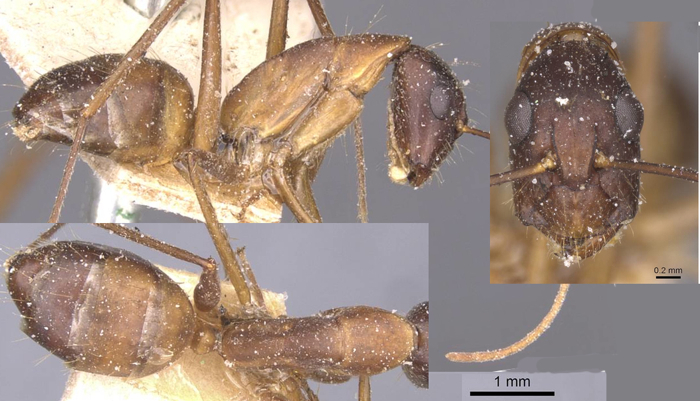 diffusus n.v., Santschi, 1917b: 292, major & minor) Santschi's (1917b) description is at Major TL 13-13.6 mm, bigger than madecassa; head brownish-red with posterior angles yellowish-red, yellow patches on gaster greater than the black areas. 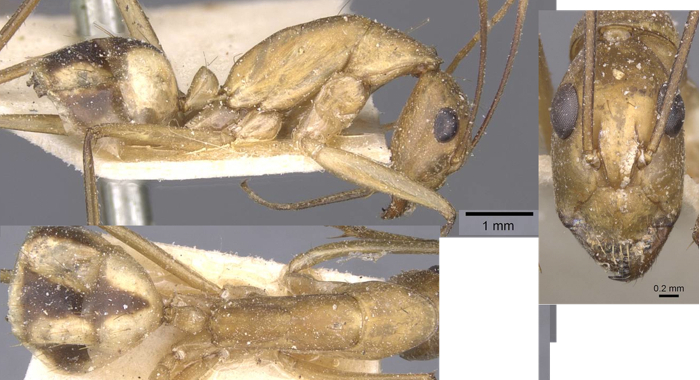 Minor TL 8 mm, yellow with a longitudinal band on the gaster which becomes less distinct in smaller workers. Matopo Hill, G Arnold. 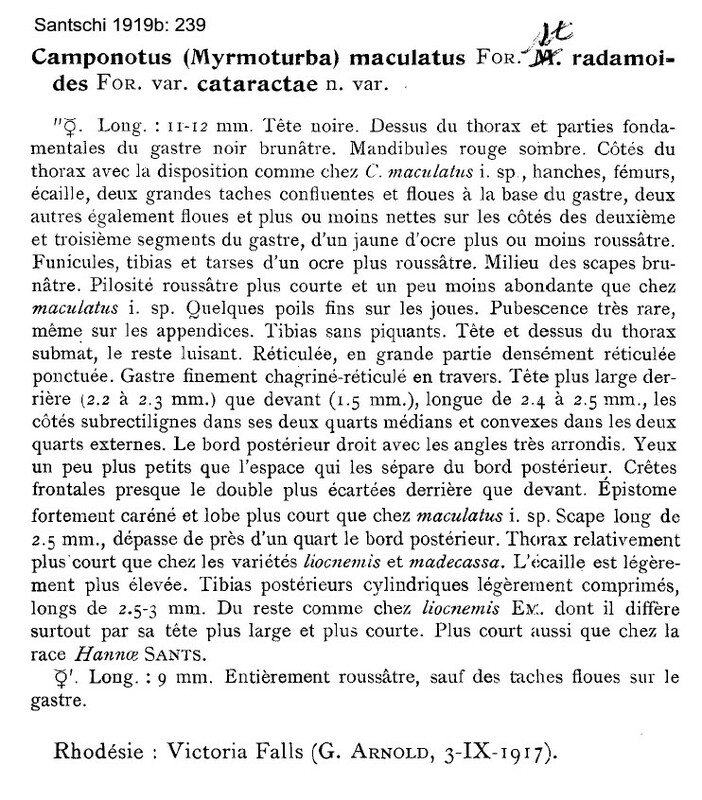 incommoda (Camponotus (Myrmoturba) maculatus F. r. thoracicus Forel v. incommoda, n. var. Forel, 1914d: 250, major & minor) Forel's (1914d) description is at TL 9.9-14.5 mm; similar to variety minor from Algeria (Forel, 1909e: 389, worker, queen & male ); but body much shinier. From Cape Province. 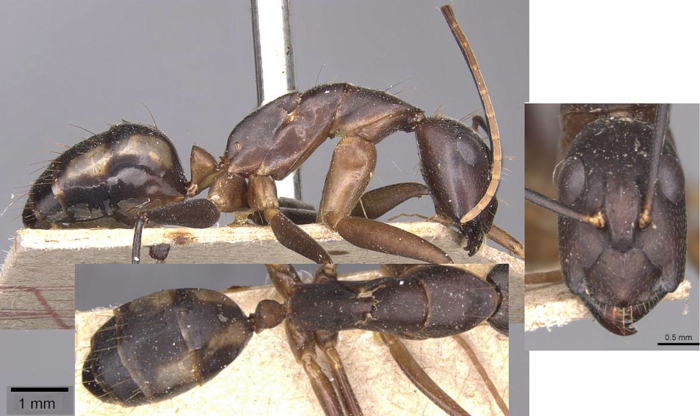 Camponotus thoracicus is purely North African in distribution. 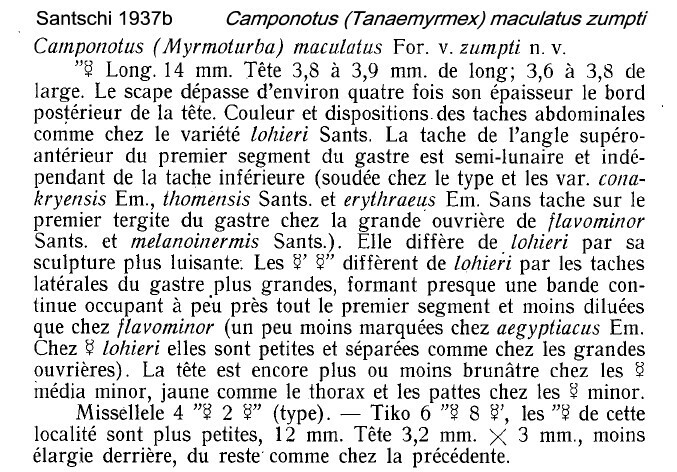 thomensis (Camponotus (Myrmoturba) maculatus Fab. 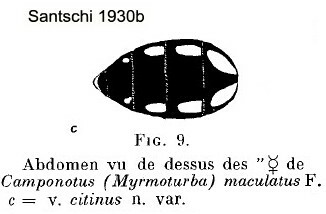 v. thomensis n.var., Santschi, 1920i: 3, major, minor & male) Santschi's (1920i) description is at . Major TL 9.5 mm, characterized by the smallness of the lateral patches on the gaster. Collector de Seabra. 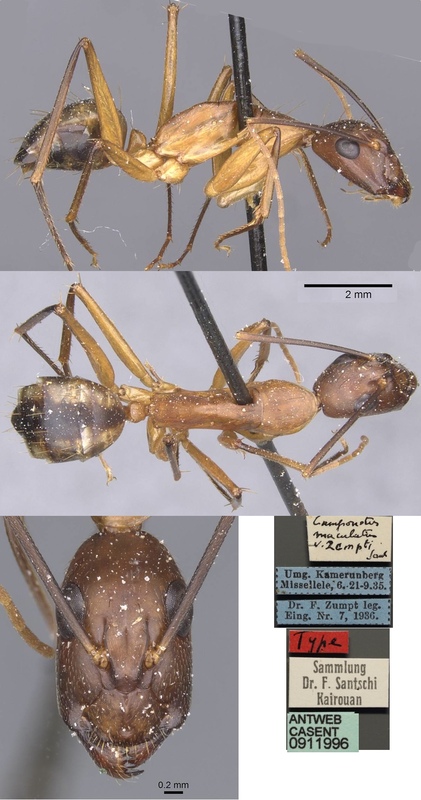 zumpti (Camponotus (Myrmoturba) maculatus F. v. zumpti n.v., Santschi, 1937b: 103, worker) Santschi's (1937b) description of zumpti is at . Major TL 14 mm; HL 3.8-3.9 HW 3.6-3.8; scape slightly surpasses the occiput; overall colour and light patches as with lohieri, also more shiny. From Missellele. B melanocnemis-group gaster black and only small antero-lateral blotches . 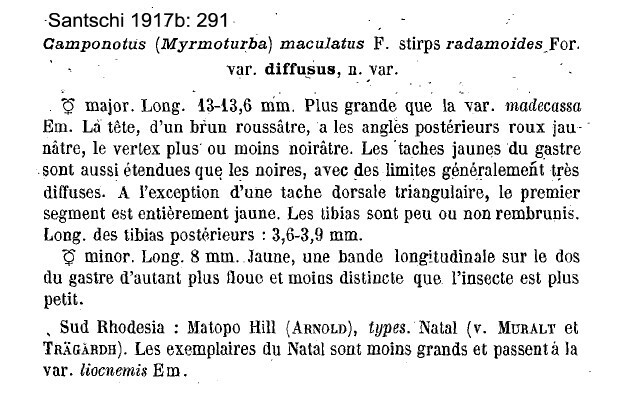 flavifemur (Camponotus (Myrmoturba) maculatus F. v. flavifemur n.v., Santschi, 1937g: 84, worker & queen) Santschi's (1937g) description is at . 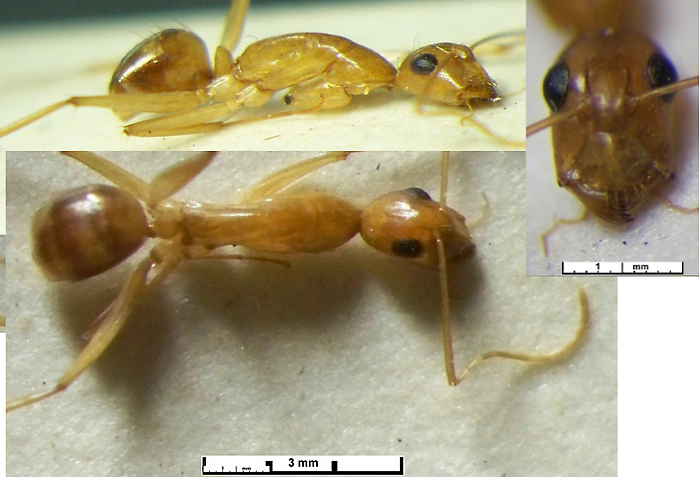 Worker similar to lohieri (major TL 14 mm) and zumpti Sant. but with the femora and tibiae pale yellow contrasting with the red ochre or ferruginous mesopleurosternum and metasternum (as in the other varieties); tibia with brown black aguillons passing into ferruginous in the distal third. Lake Victoria, Mwanza (Mwanga). 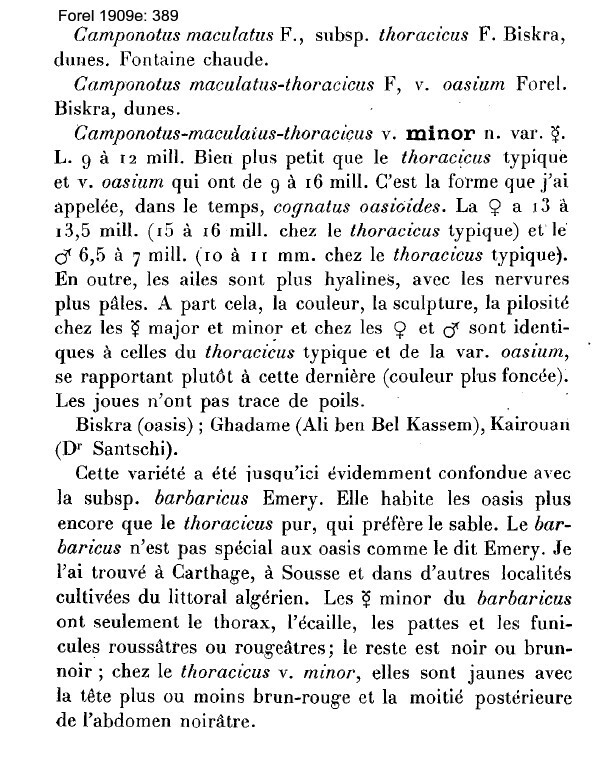 flavominor (Camponotus (Myrmoturba) maculatus F. st. melanocnemis Sants. 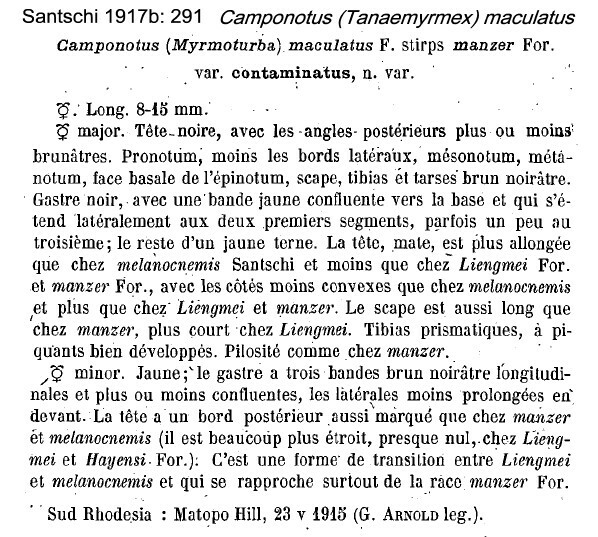 v flavominor n.v., Santschi, 1920i: 4, major & minor; name in Emery, 1925b: 87, major & minor) Santschi's (1920i) description is at . 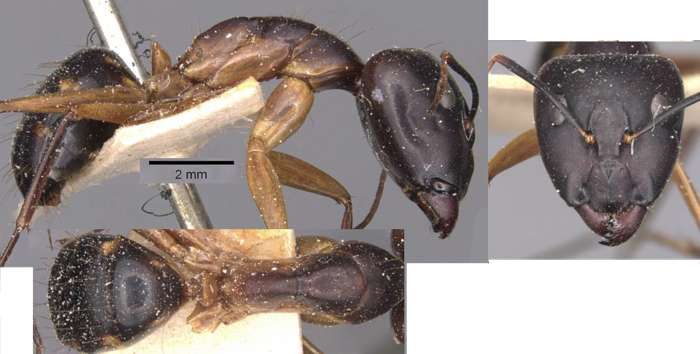 Size and colour as lohieri (major TL 14 mm) but differs from melanocnemis, lohieri and thomensis by the yellow colour of the head and appendages (brown in the others); major propodeum profile almost rectilinear (weakly convex in lohieri). Upper Dahomey, Kouand�, collector Desanti. 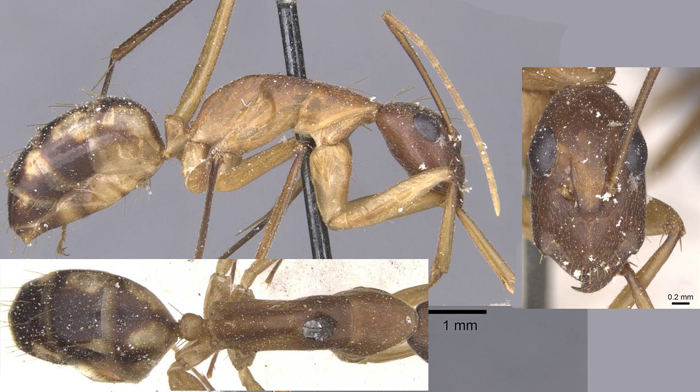 lohieri (Camponotus (Myrmoturba) maculatus Fab. st. melanocnemis Sants. 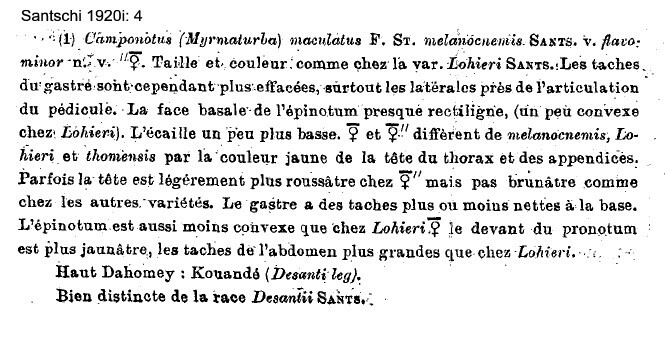 v. lohieri n. var. 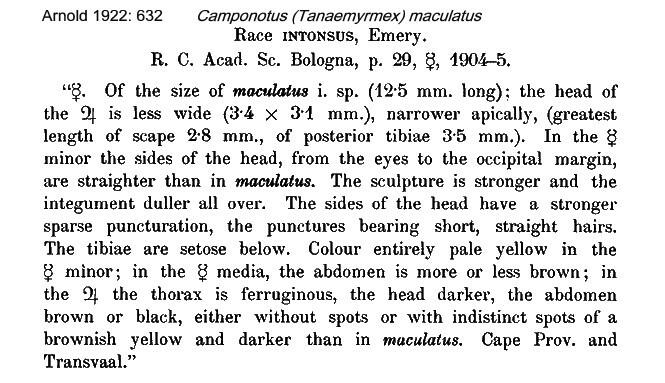 Santschi, 1913c: 313; as variety of maculatus, Emery, 1915g: 22, worker) Santschi's (1913c) description as a variety of melanocnemis was - "Worker - head more matt especially towards the posterior angles, and the gaster with a yellow ochre patch on the side of the second segment plus three patches at the base of the first segment, otherwise the gaster is entirely black, as with melanocnemis", from Ivory Coast, Jacqueville, coll R P J H Lohier. 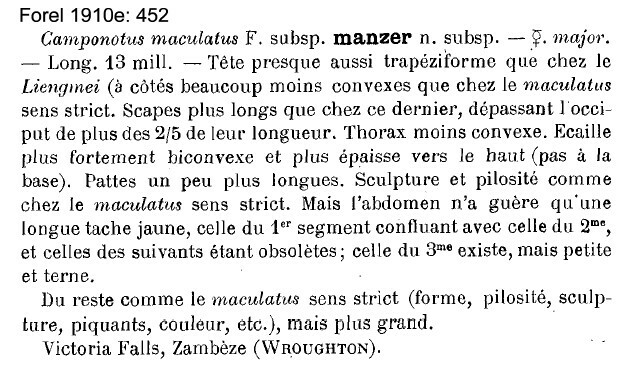 manzer (Camponotus maculatus subsp. manzer n. subsp., Forel, 1910e: 452, major) Forel's (1910e) description is at . 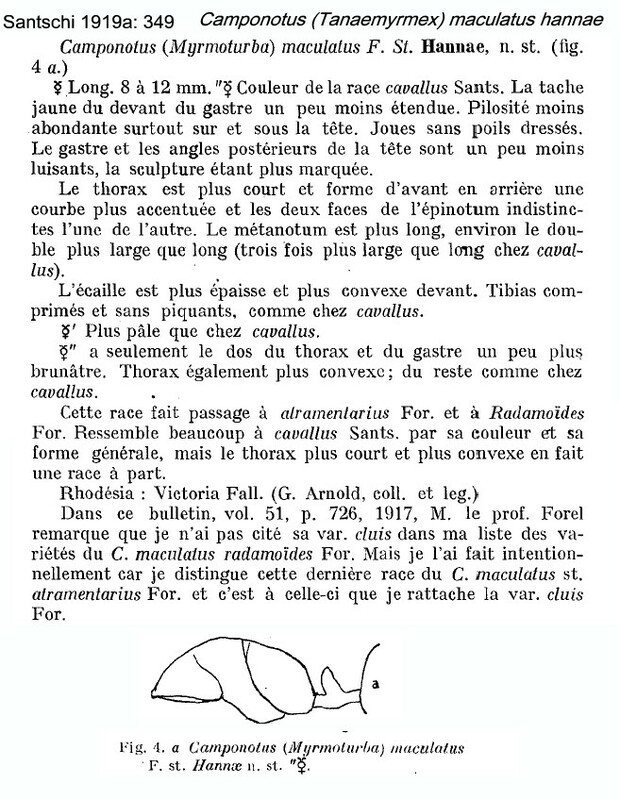 Arnold (1922: 625) gave a translation, this is at . 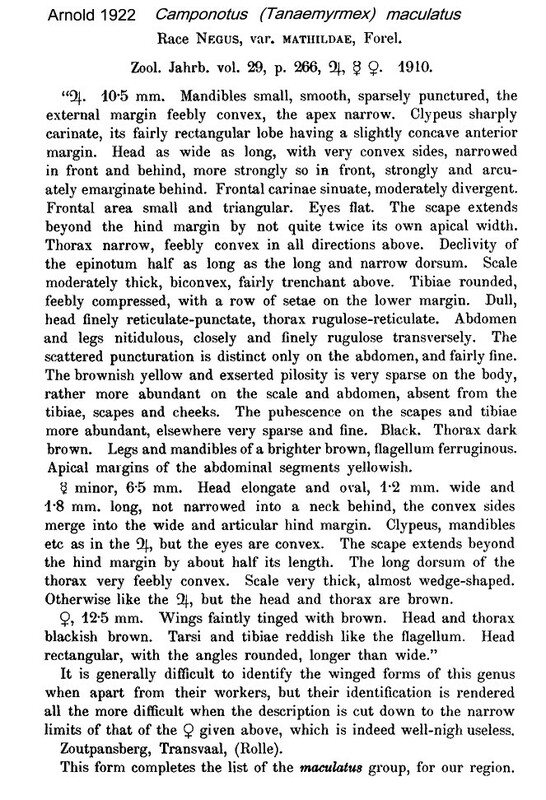 Major TL 13 mm, head near trapeziform, as lohieri, with sides slightly less convex than the type maculatus; scapes longer, supassing occiput by about two-fifths of their own length; alitrunk less convex, petiole scale strongly biconvex; lateral light patches on first and second gaster segments confluent and none on the more posterior segments. Victoria Falls, collector Wroughton. 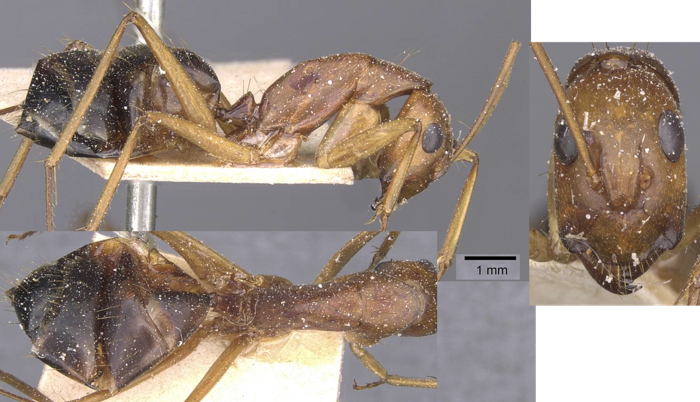 melanocnemis (H. Pobeguin, in Santschi, 1911c: 368, soldier; Camponotus (Myrmoturba) maculatus F. stirps melanocnemis , Santschi, Santschi, 1915c: 278, worker: raised to subspecies by Forel, 1915, with its junior synonym schultzei, Forel, 1912j: 179, major, minor & male) Santschi (1911c) had the major as - differing from the type (maculatus) by the darker colour of the gaster patches, which are brownish-black; sometimes the gaster is entirely black, the tibiae brown-black; the sculpture is slightly shinier on the posterior angles of the head; the dorsum of the propodeum is slightly longer. 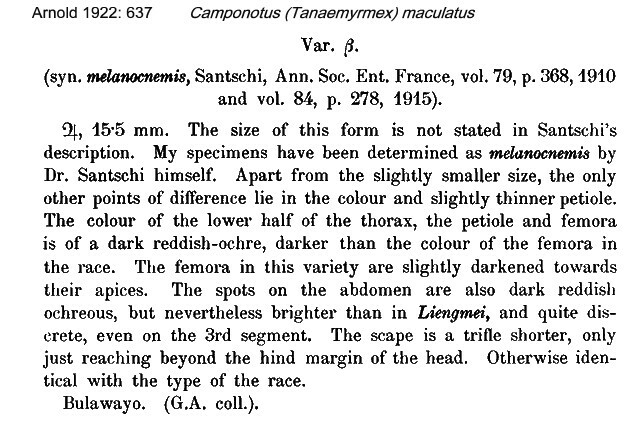 Santschi (1915c) described melanocnemis - this race is very close to the type in general form. 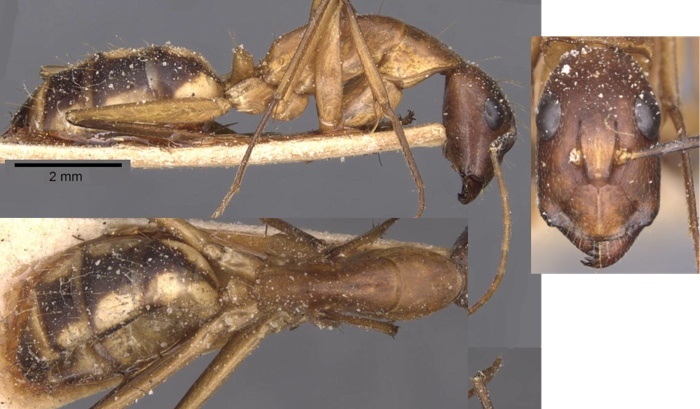 The head is a little larger and the frontal carinae slightly further apart, The thorax profile is as arcuate, but somewhat more robust and the propodeum is larger. 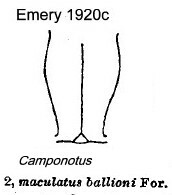 The posterior tibiae are longer, more than 4 mm. The sculpture is as matt as the type on the head and thorax, but the sides of those parts are generally more shiny. The brown-red pilosity is translucent on the head, otherwise as the type. The overall colour is always darker; with the posterior edges of the thorax and gaster, except for the patches, black or nearly so, although the narrow yellow border persists as in the type; yellow ochre parts of legs are less extended, the tibiae and tarsi are more or less brown black. 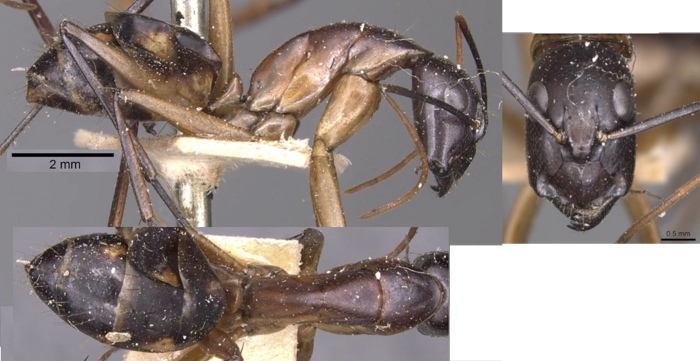 The patches on the gaster are much more reduced, sometimes absent, The male is black leading to the conclusion that this is a sub-species - in the type the male is yellow with brown patches. 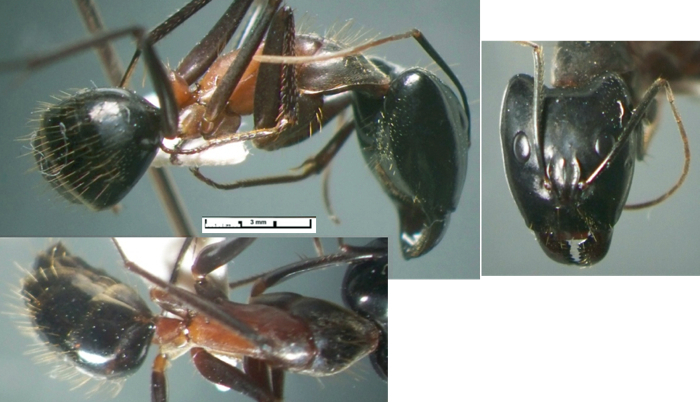 The minor has the head black or dark brown-red; the gaster is black, sometimes basally spotted; the tibiae and dorsal thorax are darker but sometimes ochre in the smallest workers. Head slightly longer than the type and slightly wider anteriorly, with sides straight forward of the eyes and less convex behind, with a distinct occipital border. Thorax profile less convex than type and than in desantii. Petiole scale lower. 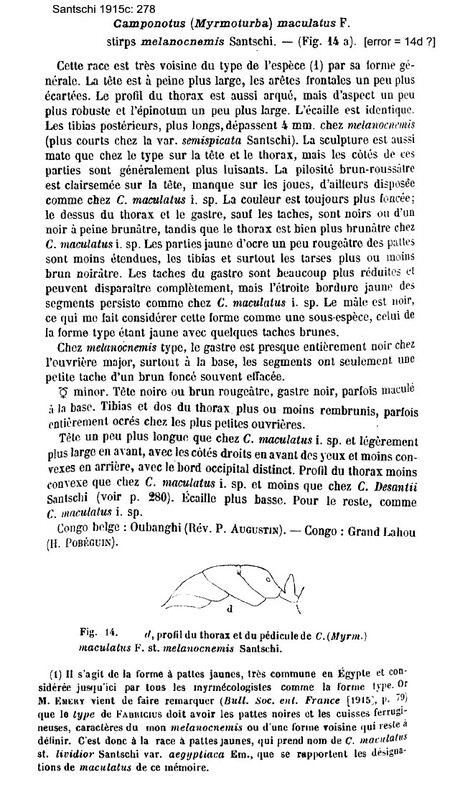 Specimens from Za�re - Oubangi, by Rev. P. Augustin; also from Congo, Grand Lahou, by H. Pob�guin. 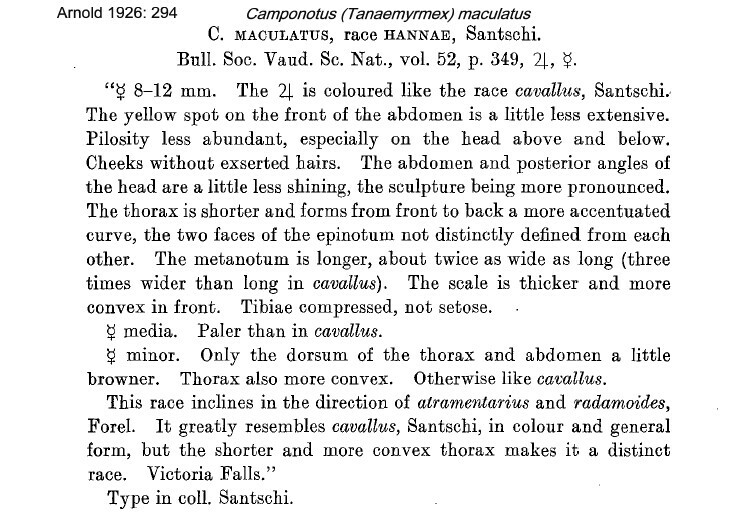 Santschi (1915c) also notes on lohieri (above) as a variety with the patches rather clearer and more apparent, but smaller; except for the base and upper part of the first gastral segment with is more or less yellow ochre, the sculpture is less shiny. 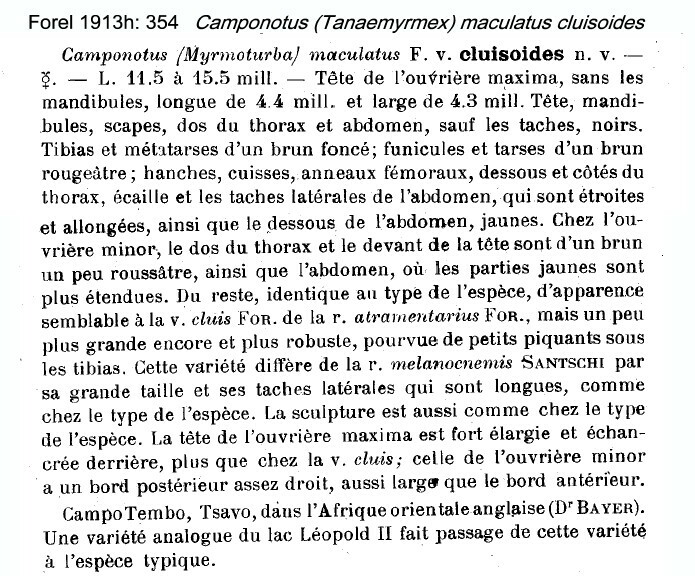 Specimens from Ivory Coast, Jacqueville by Lohier; types from Benin, Upper Dahomey, Kouand�, by Desanti; also from Sa� Thom�, by Gravier; and Senegal, by J.de Gaulle. 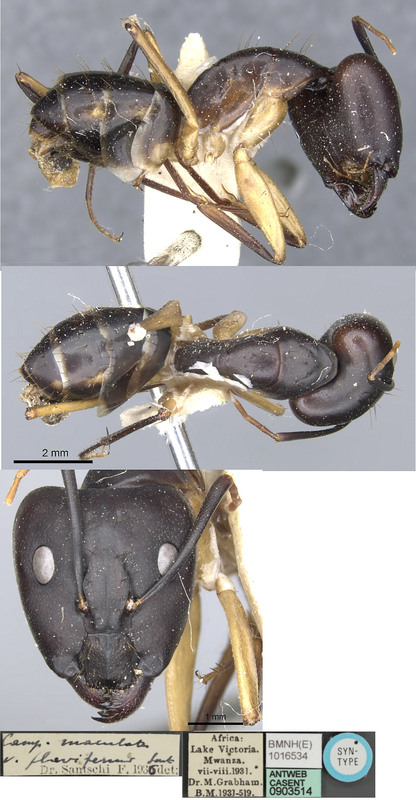 schereri (Camponotus maculatus F., subsp. Schereri n. subsp., Forel, 1911e: 289, worker & queen) Forel's (1911e) description of schereri is at . Major TL 12-13.5 mm. Hindleg black; gaster with well marked small yellow flecks; head wider than type. 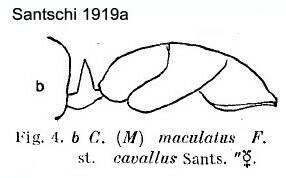 Santschi (1915c) also described schereri as - differs from melanocnemis by having more matt sculpture on the sides of the thorax and head. The thorax profile is less convex; and petiole scale less convex in front. Erect hairs a little more abundant on the body, but colour the same. Sometimes the angles of the head are slightly rust coloured, also seen in lohieri. The posterior tibiae are ca. 4 mm, with well developed denticles. Specimens from Liberia, the types of Scherer, from Nebena; southern Nigeria, Olokomeji, by Silvestri; and, Guinea, Kakoulima, by Silvestri. C group with an entirely black gaster . atramentarius (Camponotus maculatus F. var. atramentarius, Forel, 1904b: 379, worker; Forel, 1910f: 26, queen) Forel's (1904b) description is at . 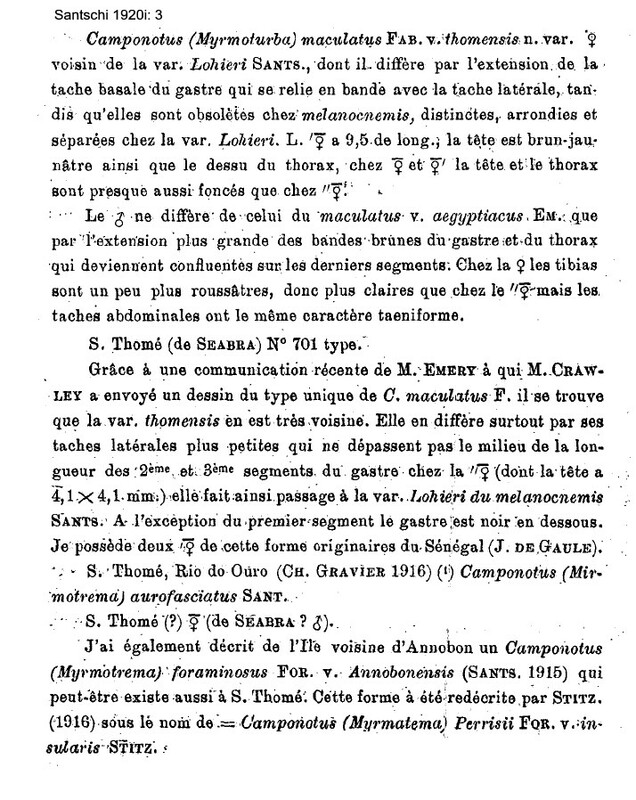 Arnold (1922: 625) gave a translation, this is at . 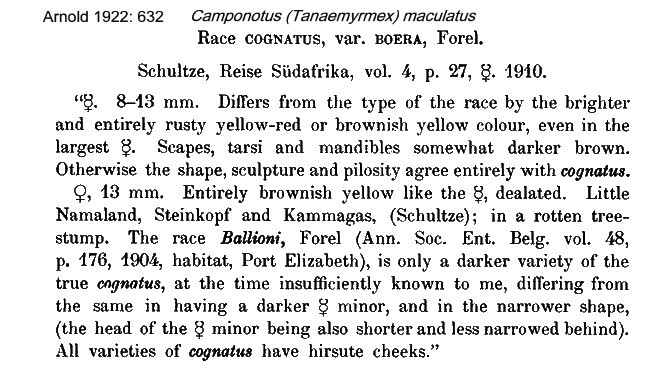 "Identical to the type form, but almost entirely black; except the funiculi, base of the tarsi and a narrow band on the gaster segments, plus sometimes the sides of alitrunk partially dark yellow brown. A little more shiny than the type, recalls melanoticus and substitutus. Transition to the type is by all the varieties of colour. 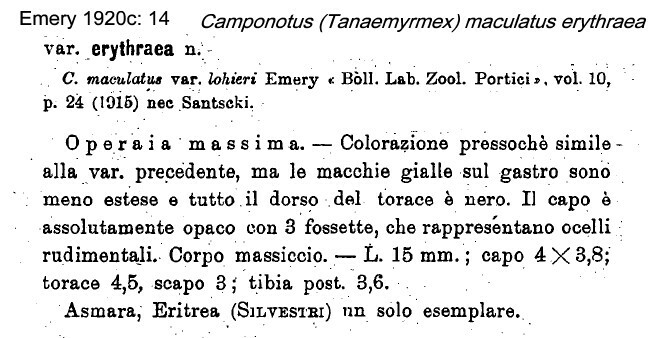 Tibiae not setose"; from Ethiopia, collector Dimitriev". 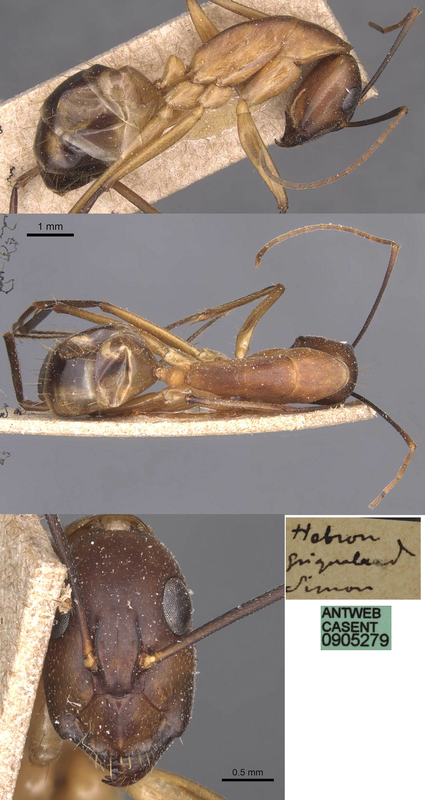 No type images on Antweb (October 2014). 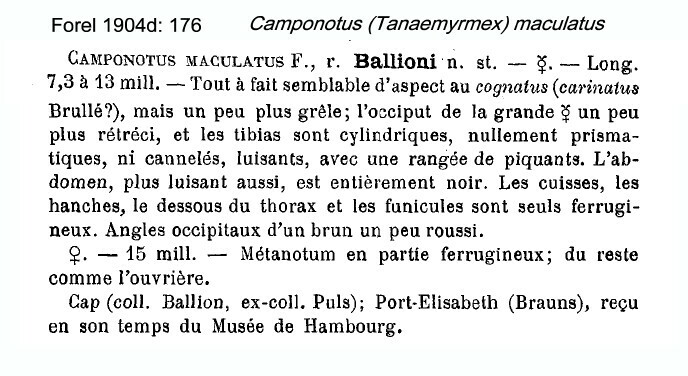 ballioni (Camponotus maculatus F. r. ballioni n. st., Forel, 1904d: 176, worker & queen) Forel's (1904d) description is at . Arnold (1922: 632) gave a note, this is at . 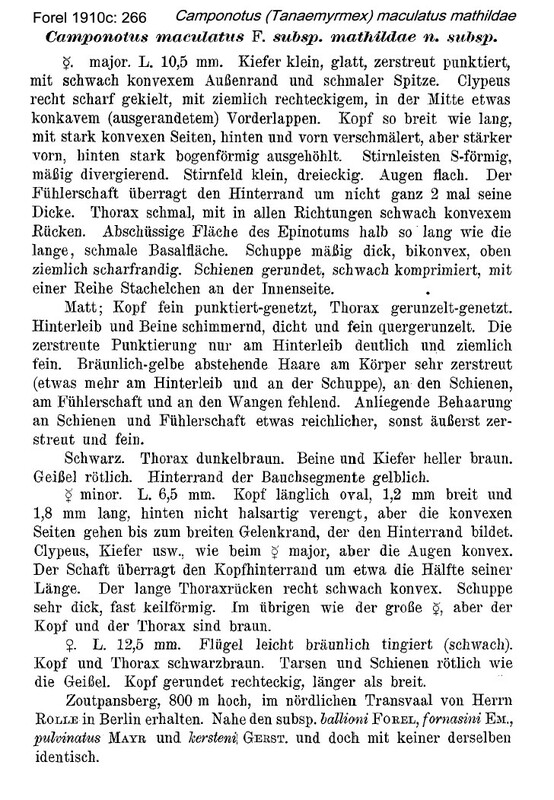 TL 7.3-13 mm; "Only a darker variety of the true; gaster entirely black"
cognatus (Formica cognata, Smith, F., 1858b: 35, major & minor; Mayr, 1862: 655, queen & male) Smith's (1858b) description is at . 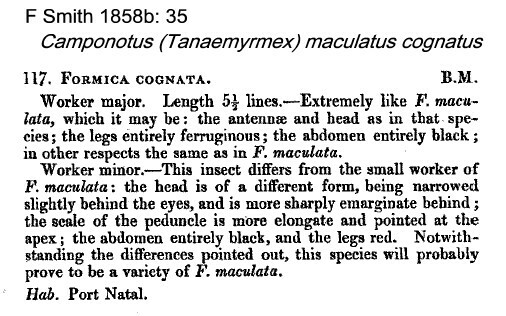 "Extremely like F. maculata, which it may be; the antennae and head as in that species; the legs entirely ferruginous; the gaster entirely black"; TL 11.65 mm; Port Natal. Minor head narrowed slightly behind the eyes, gaster entirely black, legs red. 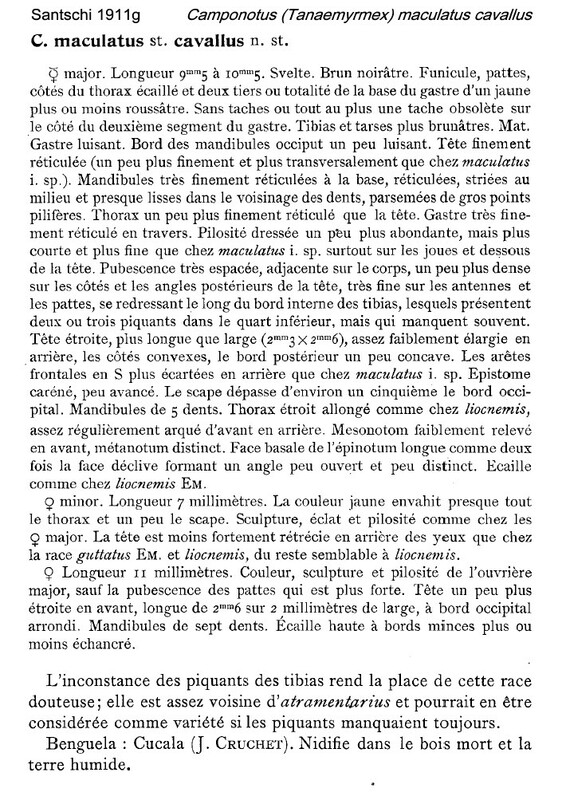 intonsus (C. maculatus intonsus n. subsp., Emery 1905d: 29, footnote, Major & Minor) Emery's (1905d) description is on . Arnold (1922: 632) gave a translation, this is at . 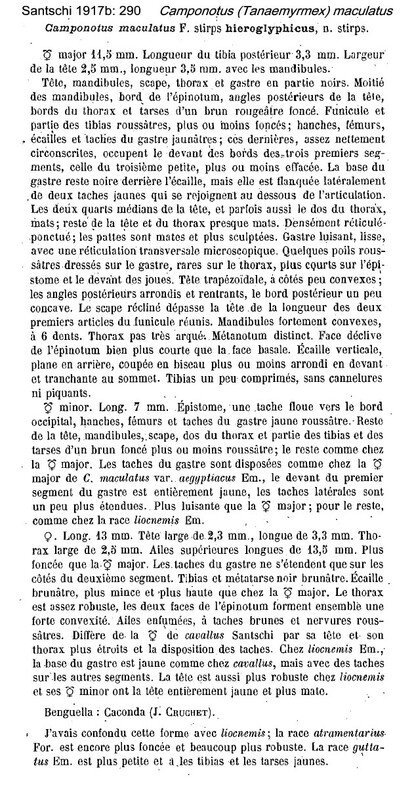 Major TL 12.5 mm, HW 3/1, SL 2.8; gaster of major wholly brown or black, either without patches or with dark indistinct patches; tibiae with ventral setae. Cape and Transvaal. 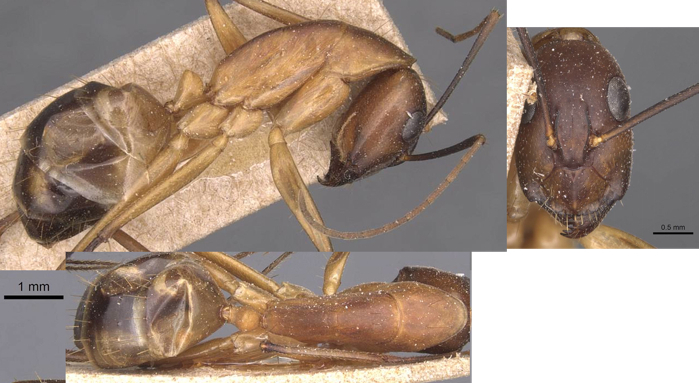 mathildae (Camponotus maculatus subsp. 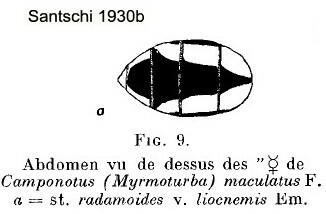 mathildae n. 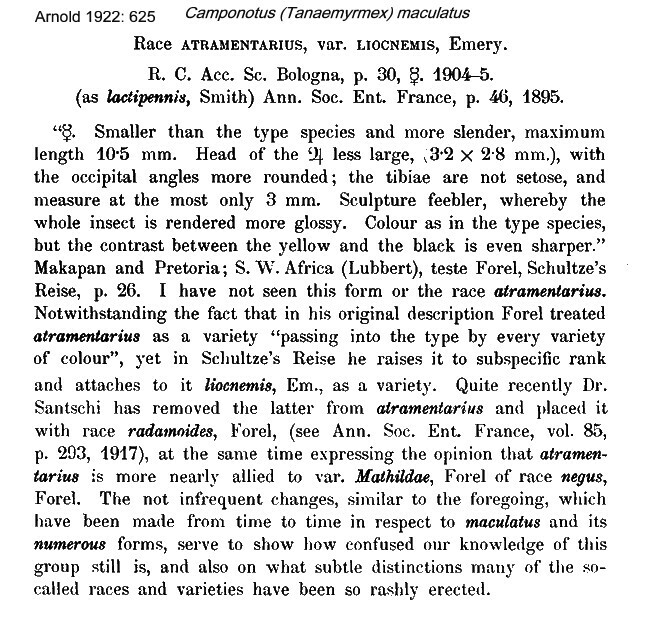 subsp., Forel, 1910c: 266, major, minor & queen) Forel's (1910c) description is at . 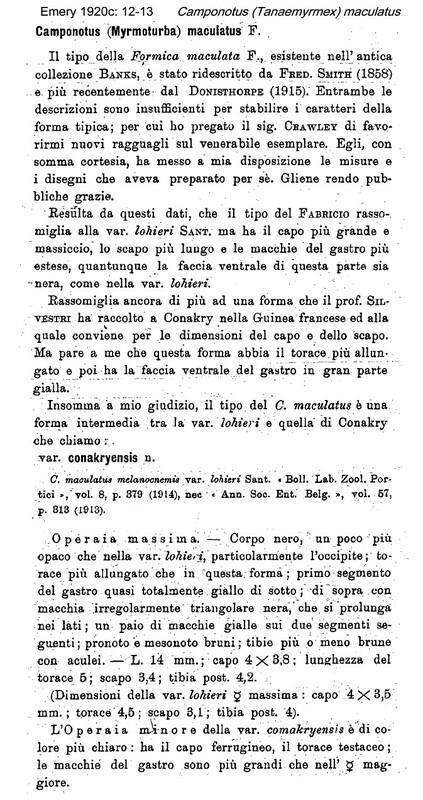 Santschi (1914b) had more at . 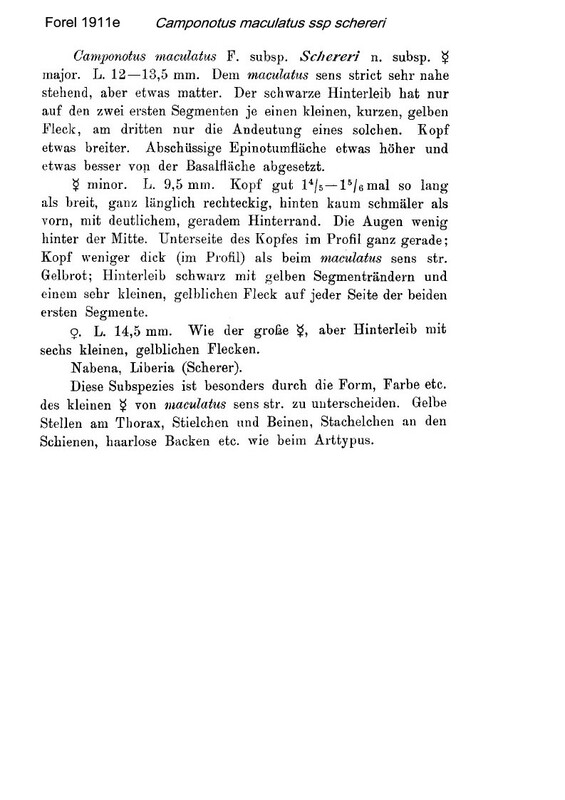 Arnold (1922) gave a translation which is at . 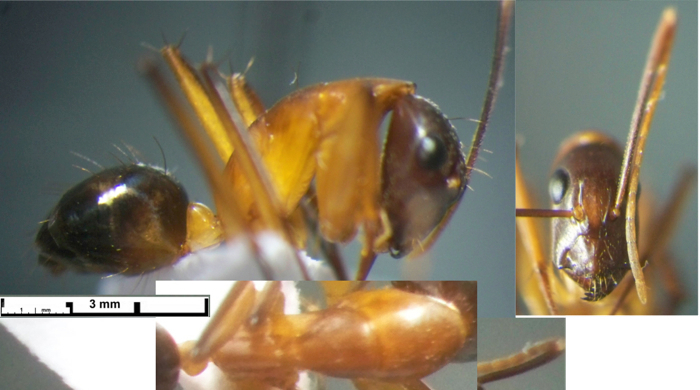 TL major 10.5 mm; black, alitrunk dark brown, legs and mandibles brighter brown; apical segments of gaster yellowish. Zoutpansberg, 800 m asl, collector Rolle. 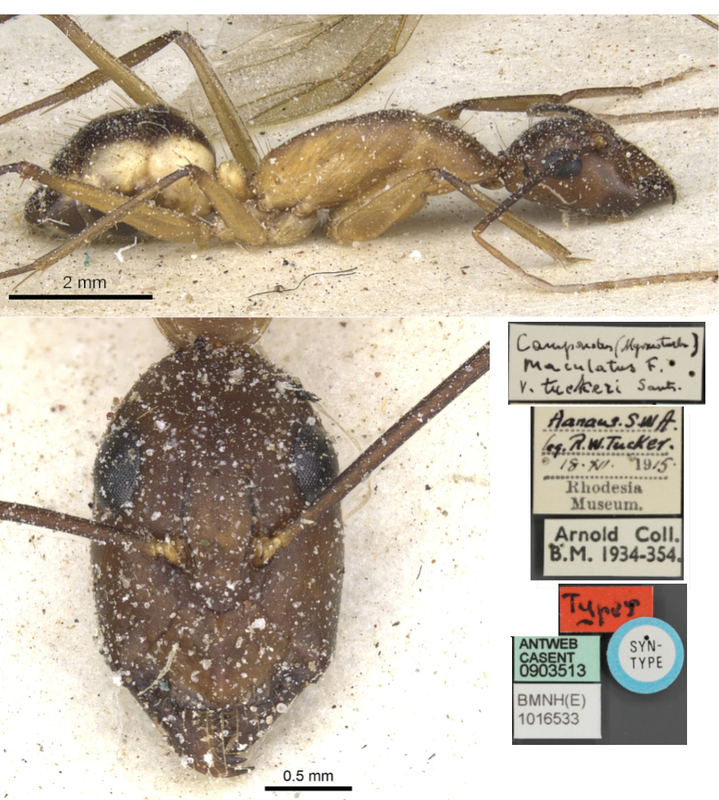 radamoides (Camponotus maculatus i. sp., var. 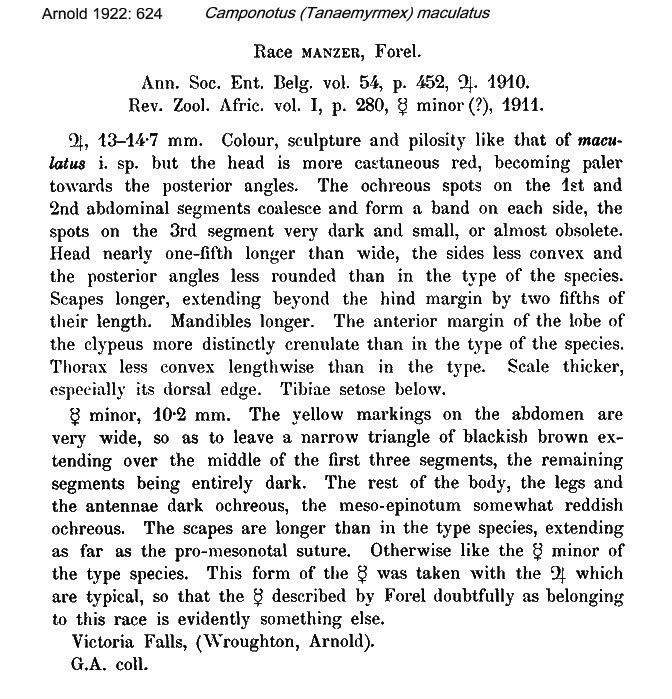 radamoides, Forel, 1891b: 213, major & minor) Forel's (1891b) description was brief and noted the major and minor workers were similar to the type form but the gaster was entirely black; the occipital angles on the major were reddish; generally smaller - the major with less convex sides to the head and the petiole scale of the minor lower and more obtuse (Andramgoloaka Forest, collector Sikora). semispicatus (C. (Myrmoturba) maculatus st. Mathildae var. 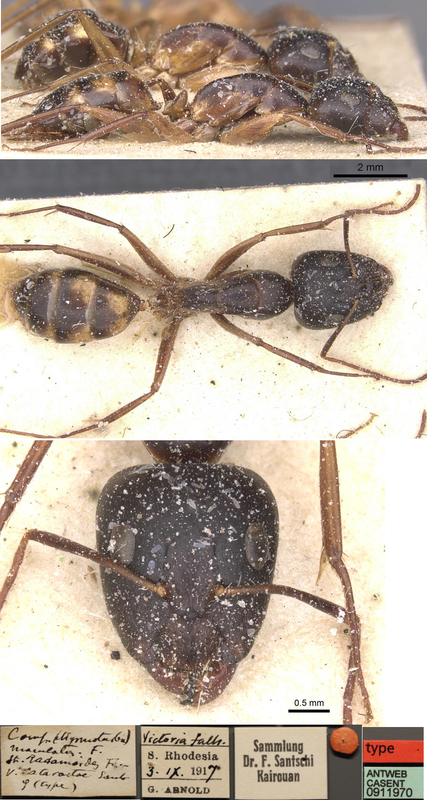 semispicta, nov., Santschi, 1914b: 130, worker; Emery, 1920c: 5; Menozzi, 1930b: 116, queen) Santschi's (1914b) description is at . Differs from mathildae by the colour of the sides of the alitrunk and legs which are yellow ochre, that is darker and more like melanconemis. 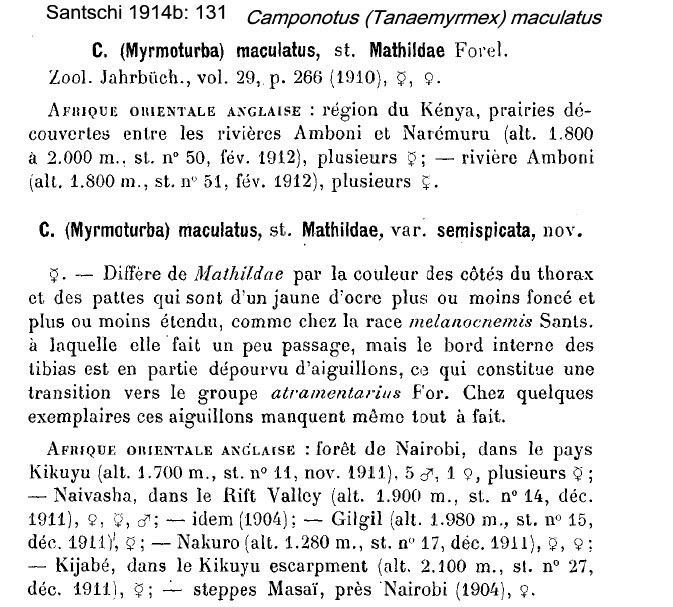 Numerous specimens and collections in Kenya by Alluaud and Jeannel. D group with pale non-blotched gaster . 11�46'N 27�14'E; 5.ii.1928 solitary on tree; OUMNH; collector H Silvester Evans.